An indispensable resource for selecting a destination and planning a trip in the High Uintas. High Uinta Wilderness—three emotion-charged words that describe a very precious place. The highest mountains, the unique alpine ecosystem, and the largest designated Wilderness in Utah are all found here. 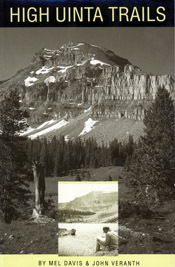 This is a complete rewriting of the original High Uinta Trails, first published in 1974. Access road and land management information has been expanded, new areas and routes have been added, and trail conditions have been completely updated.